Moab is only 90 miles from here, so I’ve been wanting to take the kids down to Arches at some point and hike to Delicate Arch. I had figured we’d go this summer, but then we decided it’d be better to do it before the heat got insane, so we went today! First pictures, then some tips. Our “ready to go” picture (a kind stranger offered to take one so we could all be in it.) The kids wore those sunglasses for about 4 minutes each. Fortunately Daniel left his hat on the whole time. I really didn’t want to worry about sunscreening his head. We made it! It was questionable there for a bit. It’s definitely not an easy hike but it is SO worth it. Just gorgeous! And now some tips if you want to make the Delicate Arch hike. This first one is sort of a cheater tip: follow the tips from any of the hiking websites. Wear sunscreen/sunglasses/hats. Bring plenty of water with you on the hike. Wear good hiking shoes. The earlier in the day the better. The parking lot gets full by about 9:30 am, and things stay busy for the rest of the day. Earlier is also better for heat too. Do this hike first thing. Before you see the visitor’s center, before you walk around anywhere else, before you do any of the driving tours. Not just for the heat and crowds, but for the kids energy levels. This hike wore our kids OUT. If they had been running around other places first I’m not sure we would have made it. I wouldn’t expect any child under 5 to make the hike without being carried at least part of the way. Kalena managed it just barely (with a couple short bits riding on grandpa’s shoulders) and she’ll be 5 this month. Bring a carrier if there’s ANY chance you’ll need one. Will (3 1/2) rode in a carrier for basically the whole way up, but walked the whole way down. The hike back is lots easier. Plan on this being the only hike you do for the day. Our kids have very high energy levels but they were spent after this. We walked around a little (at the visitors center and in town) but there’s no way they would have done another hike. If you’re not above bribery, promising our kids a toy at the end of the hike if they were good hikers worked superbly. In fact, the first time my dad offered Kalena a ride on his shoulders she asked, “Will I still be a good hiker?” She wanted that toy! So pretty! Now I want to go! (Without the trip to Grand Junction and then the drive to Moab) 🙂 I love Kalena’s, “will I still be a good hiker?” Smart girl! Come on down to GJ and we will! I love babies in hats! 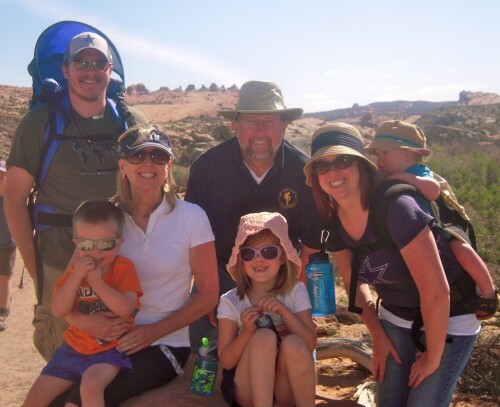 Yes, I have a question… why didn’t we go to Arches more as a family when we were growing up? 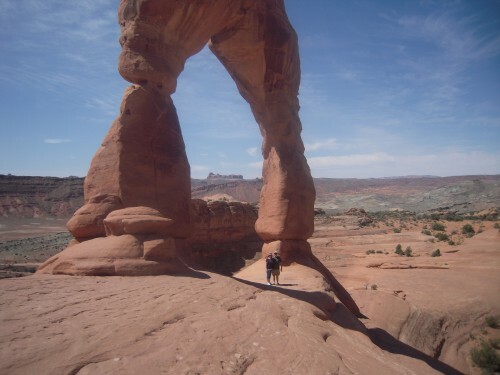 I remember going one time, and I definitely crapped out on the hike to delicate arch. 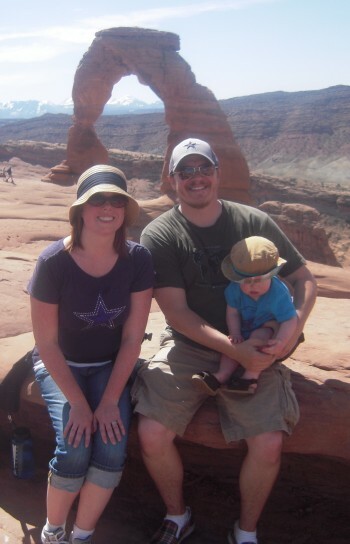 I didn’t go again until Joe and I were married, living in Fort Collins, and I realized “hey! It’s only 90 minutes from Junction, where I lived nearly my entire life! And I’m going NOW? !” So that’s less of a question, more of a forehead slap, I suppose. Well having just taking 3 kids there I can tell you don’t want to repeat that anytime soon. So maybe that’s why?